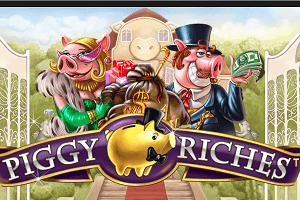 Welcome to the enormous and the luxurious pig mansion, the home of the two rich Pigs, which are the main characters of the Piggy Riches video slot. Playable from £0.15 per spin, the 2010 release features five reel, three rows and benefits from 15 fixed paylines. The Gentle Pig represents the multiplier Wild, while his lovely Madam Pig is the Scatter that triggers the Free Spins feature, which is the central attraction of the NetEnt title. Land three or more Scatters to trigger the feature where you can get up to 28 free spins with all wins multiplied. As we already said, the main characters of the 2010 release are the two Pigs. The Gentle Pig is the man of the house and he is the Wild that substitutes for all regular symbols and triples all wins when part of a winning combination. Madam Pig is the Scatter that triggers the Free Spins feature. This is a very rich family, which can be seen on the reels, with Bags packed with Gold Coins, Platinum Credit Cards, Keys of the Mansion, Wallets filled with Cash, Piggy Banks loaded with Money. Also, there are five playing cards symbols that act as low-value icons. There is nothing luxurious about the rules of the game, because the rich Pigs decided to keep it as simple as possible. The NetEnt title features five reels, three rows and offers 15 fixed paylines, which pay left to right, starting from the leftmost reel. Three of a kind is the minimum when it comes to payouts. The only exception is the Bags with Gold Coins, which will also pay for two of a kind. 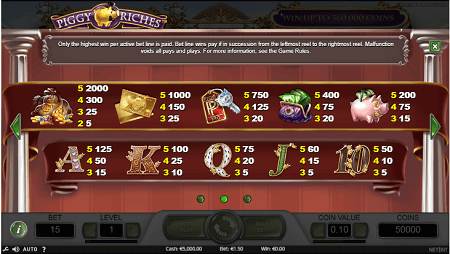 Gamers can set the coin value (£0.01 – £1) and the bet level (1-10) before they start spinning the reels. Betting starts at £0.15, while the maximum possible wager cannot go over £150 per spin. Land three or more Madam Pig Scatters on the reels to trigger the Free Spins feature. Next, you will get to pick how many free spins you will get and how big the win multiplier will be. Up to 28 freebies are available, while the win multiplier can go up to 6x. For each Scatter landed during the Free Spins feature, gamers can expect an extra free spin, so try to land as many additional Scatters as you possible can. The good people of NetEnt have set the maximum possible payout at 360,000 coins. Set the coin value to the max and you are looking at a possible win of mouthwatering £360,000. The Free Spins feature is the perfect place to land massive wins, thanks to the possible 6x multiplier, which will be applied on all wins. Piggy Riches’ RTP is 96.4%. Even though the Piggy Riches video slot is not that young, it is pretty up to date when it comes to modern technologies. The 2010 release is playable across all devices and you can spend your time in the luxurious mansion from the comforts of your homes or on the go, depending on whether you like to play video slots on desktops or on mobile devices. Even though the 2010 release may seem as a very simple video slot and even though the NetEnt title does not offer that much action, there is something about Piggy Riches that everybody loves and that is probably why this is one of NetEnt’s most popular video slot. The visuals are simple yet luxurious, the rules of the game are extremely easy and the Free Spins feature is just awesome. Up to 28 free spins at once and extra free spins for every additional Scatter landed, along with a win multiplier that can go up to 6x will help spinners reach the tasty maximum payout of 360,000 coins. With this amount of coins you can afford a mansion of your own. 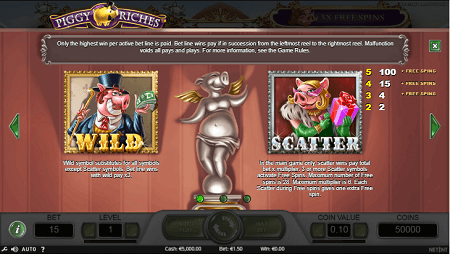 Play Piggy Riches slot at Genesis Casino!